I've noticed that the sde.st_length function works, even when the st_shapelib.dll library is not configured. I can call sde.st_length without issue: SELECT SDE.ST_LENGTH(SHAPE) FROM ROADS_SAMPLE. So clearly, st_length is not stored in the st_shapelib.dll library. Knowing this, my next guess would have been that the st_Length function would be stored in PL/SQL in the database somewhere. 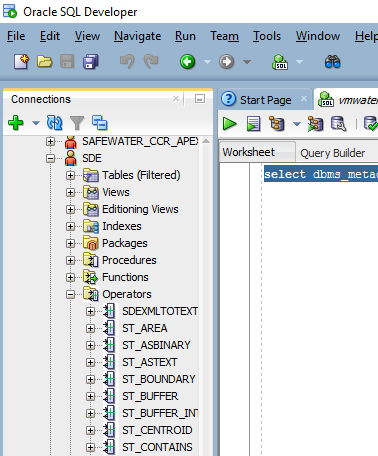 However, when I look in the Functions folder in the database (using SQL Developer), I don't see any sign of the st_length function. But I'm not clear on which of these two functions is the one in question. The more obvious choice is st_length_f, but it's got a different name than st_length, so I can't imagine that it is the function that is being called. SDE.ST_LENGTH is a custom operator and you can spot it in SqlDeveloper under the "operators" category for the SDE schema. Now my version of SqlDeveloper doesn't seem to nicely list the binding. That may be a bug in SqlDeveloper. to see that the operator is bound to SDE.ST_GEOMETRY_OPERATORS.ST_LENGTH_F which you already discovered. This function is darn simple and just as nef001 said, it returns the length attribute from the geometry with some logic to handle empty values. Not the answer you're looking for? Browse other questions tagged enterprise-geodatabase oracle length function st-geometry or ask your own question. Creating geodatabase (and st_geometry) in Oracle Express (XE) for home/personal use? Identifying geometry storage type in geodatabase stored in Oracle? Translating geometry from EPSG:23030 to EPSG:21818, then to lat long, using PostGIS? Where are Object class extension GUIDs stored in Oracle?